This journal promotes the exchange of innovation and experience in crime prevention, introducing new approaches, re-evaluating traditional theories and methods, and reporting on the latest research. The journal publishes articles which expand and improve understanding of theories, methods and policies addressing crime and its reduction or solution. Crime Prevention and Community Safety (CPCS) helps readers to identify effective strategies for improving crime prevention and enhancing community safety. It aims to keep students, researchers and professionals up-to-date with the latest debates and research findings. Coverage includes crime trends; audits for crime and disorder; policing measures and initiatives; multi-agency partnerships; begging and vagrancy; crime investigation technologies; anti-social behavior; domestic violence; zero tolerance policing; strategic planning; fear of crime; international perspectives on crime control; racial harassment; alcohol and drug related crime and disorder issues; tourism, security and disorder and more. Each issue presents research papers, reviews, and critiques of the latest developments in the field. Additional features include “A Letter From” - a summary of recent developments around the world; and “Surfing the Crime Net” - a review of online resources for crime prevention and public safety. 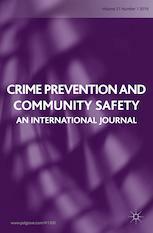 Crime Prevention and Community Safety journal benefits a broad audience of crime prevention officers, community safety personnel, police commanders, probation services, prison management, social science researchers, law firms, private and corporate security, crime analysts, social services, investigators, national and local government, politicians, victim support agencies, magistrates, policymakers and community groups.